Kolkata: High drama unfolded as the West Bengal State Election Commission (SEC) on Tuesday reversed its decision of the previous night to extend the deadline for filing nomination papers for panchayat elections in the state by a day, triggering an immediate legal challenge by the Bharatiya Janata Party (BJP). Late on Monday, the Commission issued a notification saying that nomination papers could be filed between 11am and 3pm on Tuesday. But on Tuesday morning, the Commission reversed its decision after Kalyan Banerjee, vice-president of the Trinamool Congress, objected to the extension of the deadline. The Commission said in its notification issued on Tuesday that Banerjee had pointed out “legal infirmities" in the decision to extend the deadline. In its latest notification, the Commission also noted that there was no specific instruction from the Supreme Court to allow more time to file nomination papers. The BJP immediately moved the Calcutta high court, which issued an injunction on the Commission’s notification on Tuesday, but at the same time did not order the Commission to extend time for filing nominations. The Supreme Court had earlier declined to interfere in the election process. Opposition parties in West Bengal have alleged that their candidates are being obstructed from filing nominations. While the BJP had moved the Supreme Court last week, seeking its intervention to ensure the polls are not rigged, the Congress had moved the Calcutta high court. But both the courts have asked the Commission to deal with the complaints. After Tuesday’s turn of events, the Left Front has decided to move the apex court on Wednesday. The Commission is acting like a puppet in the hands of the ruling party, Left Front chairman Biman Bose said on Tuesday, adding that if things head further south, the Left parties could call a general strike. 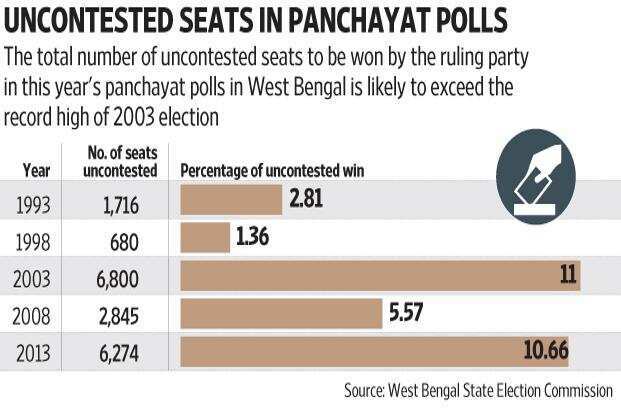 In every panchayat election in West Bengal, thousands of seats have been won uncontested by the ruling party. For instance, in Birbhum district, the Trinamool Congress has already secured the zilla parishad, winning 41 of the 42 seats without contest. According to provisional figures released by the Commission, neither the BJP nor the Left parties have been able to field candidates in all the 58,692 seats to which polling is to be held between 1 May and 5 May. It isn’t, however, immediately clear how many seats the Trinamool Congress has won uncontested. The BJP had till Monday filed nomination papers for 34,507 candidates. The party has fielded 27,789 candidates for 48,650 gram panchayat seats to which elections are to be held. At the panchayat samiti level, the BJP is to contest 5,952 of the 9,217 seats, and at the zilla parishad level, it is to contest 766 of the 825 seats. Scrutiny of nomination papers is still pending. The Communist Party of India (Marxist), or CPM, has managed to field only 17,303 candidates at the gram panchayat level, followed by the Congress with 7,239 candidates. At the panchayat samiti level, the CPM has fielded 4,236 candidates and the Congress 1,646. At the zilla parishad level, the CPM and the Congress have fielded 563 and 377 candidates, respectively. Commenting on the violence witnessed in the past week in West Bengal over filing of nominations, J.P. Nadda, the Union minister for health and family welfare, said on Twitter: “What we have witnessed in West Bengal is a precursor to how the Third Front will behave if it tastes power. Anarchy will reign and rule of law will be murdered." With Trinamool Congress chief Mamata Banerjee looking to take centre stage in national politics ahead of the 2019 general election, it was expected that her Trinamool party would not give the BJP opportunity to question governance standards in West Bengal. But an election analyst said in this year’s panchayat elections, the ruling party is likely to set new records of winning without a contest, beating the high of 6,800 or 11% of all seats in 2003. This person asked not to be named.